CARRIE: Till now, I’ve more or less taken charge of helping my readers try various methods of getting their dogs involved. Aside from luring Fido with a treat, what are your top tips for getting a pup comfortable with the activity happening on the mat, and further, getting involved in it along with us? JESS: Nothing is more reassuring and comforting to animals than routine and consistency. Nikki B. has been joining me for yoga for such a long time that she is not anxious when watching me. The keys are frequency of practice and trust. If you begin practicing yoga once a month, or just once in a great while, your dog will not respond appropriately because he or she will not understand what’s going on; it will be too new and too different than your usual routine. If you begin practicing yoga every day for 15 minutes, however, and then gradually add more time to your daily practice, your dog will recognize this as a new routine and will be more apt to join in, because with routine and consistency comes comfort and trust. Start your practice by changing the entire ambience of the room; dim the lights, soften the music, open the windows (weather permitting), maybe even light some candles—out of reach of your dogs. Anything that you consistently do to begin your practice will help your dog understand that this is time for yoga; it is time to be on the mat and bond with you. This sets the stage for your new routine. Once you have set the tone for yoga, gently set up your mat and your props (with some of your furry friends’ favorite treats nearby) and get yourself into a comfortable position for establishing that deep belly breathing pattern. This will all help to reassure your dog that this a happy, enjoyable time, and that you are welcoming him or her to join you. Start with simple, flowing poses that require little movement. Gradually move onto more challenging, physically involved poses that require more movement and involvement from your dog(s); then end your practice with more simple, resting poses. Keep in mind that some days, your dog will want to be more involved in your practice and on other days, he or she may not want to be very involved in your practice at all; that’s perfectly okay! Dogs have their moods and their attitudes change just like you and I do, and we have to honor that and respect that, or we will not get their respect in return. Never force your dog into a pose, either; instead, always offer a place on your mat for your dog to lie down or sit, and reward them for participating in your practice, but never punish them for not participating. The key is in waiting for your dog to be ready. When he or she is completely comfortable with your activity, and trusts that this is a safe, happy experience, they’ll surprise you and join in without an invitation. 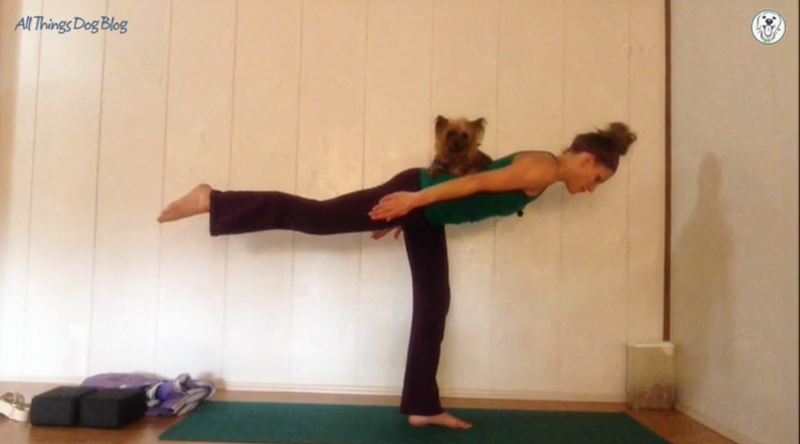 That’s when you know you have truly gained a doga partner! Don't forget to offer a treat when your dog joins in, to cement the memory with a positive reinforcer. With #SuperDogSunday right around the corner, Tanner and Oliver are looking forward to noshing on a Z-Filet from @ZukesPets! Check out our Event Barkers Twitter Party and ways to win US-made natural treats at the link. Also, be sure to check out our series of short, instructional doga videos and other helpful posts that share tips on modifying your practice to suit your needs. You'll find all this and more at our Doga page, where our focus is on helping you bond with your dog through yoga.